The majority of your home’s heat is lost through its windows, walls, attics and roof, so it is crucial to take the proper measures to ensure that your property possesses the necessary insulation in these locations. Many homeowners throughout the Berlin area do not understand that insulation loses its effectiveness over the coarse of time, which leads to greater levels of heating and cooling losses for your home and rising utility expenditures. Many homeowners believe that simply installing additional insulation or replacing the current insulation is an effective solution. However, in most cases this will not be the most effective method to your insulation problem. A practical alternative is to hire the Berlin Attic Insulation Contractors at Sensible Home Products to professionally install eShield™ multi-layer radiant insulation for your home. eShield™ is a state-of-the-art insulation product that works in synchronicity with your existing insulation. Studies have show that eShield™ has been proven to more effective than installation that contains twelve additional inches of basic fiberglass insulation. eShield™ will be very beneficial in helping you cut costs on materials as well as considerably lowering your utility bills. As opposed to digesting the hot or cold temperatures, eShield™ actually reflects it away from your home, protecting your interior from being effected by outdoor temperatures, and reducing your heating and air conditioning usage. As every Berlin, Connecticut area homeowner understands, heating and cooling utilities will contribute to a large portion of your energy costs, and by reducing on usage of these utilities with eShield™ insulation, the impact on your expenditures will be substantial. eShield™ multi-layer reflective insulation is based on the same advanced technology and design as a NASA space suit, it works to reflect radiant heat. In this way, eShield™ is able to protect homes from the sun’s searing rays during summer and retain interior warmth during winter, dramatically reducing your energy consumption year-round. 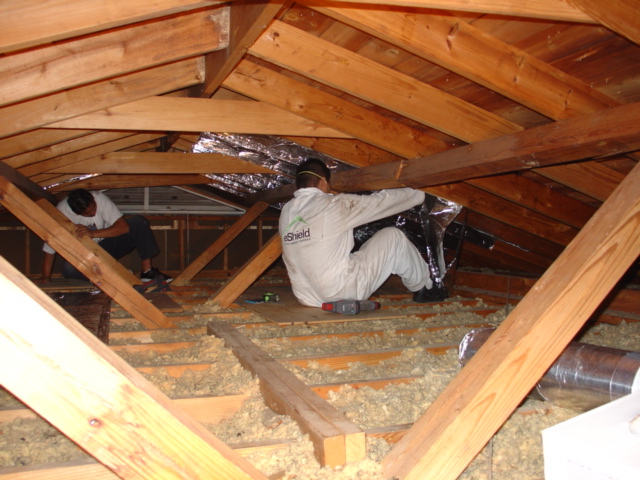 Sensible Home Products employs experienced eShield insulation installation professionals, to ensure that you receive all of the energy savings offered by the eShield attic insulation product. Contact us today to set up your no-cost consultation and hear even more great benefits of eShield. Based in Berlin, CT, Sensible Home Products provides eShield Insulation Services, Energy-Efficient Windows & Doors Installation, Garage Doors & Home Additions Design & Build, Roofing Systems, Siding Installation or Repair, RainPro Gutter Systems Installations. We service the following and surrounding towns in the Hartford County area; Berlin, New Britain, Glastonbury, Southington, Middletown, Meriden, Hartford, Newington, Bristol, Wolcott and beyond!